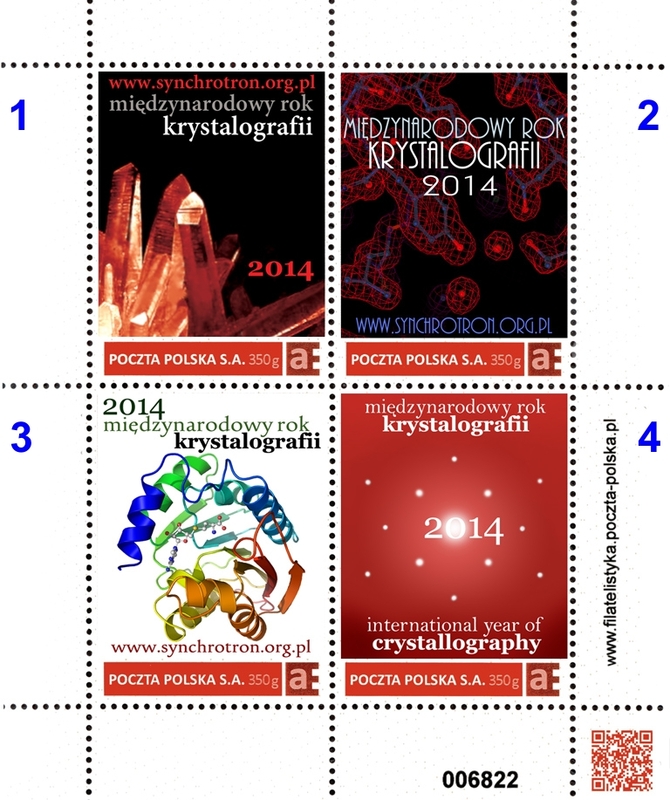 The Polish Synchrotron Radiation Society (www.synchrotron.org.pl) in cooperation with Polish Mail have issued a limited series of four postal stamps to mark the International Year of Crystallography, IYCr2014. The idea was to draw the attention of the general public to the subject of crystallographic research. Stamp 1 presents the beauty of natural quartz, whose crystals are often associated with crystallography and mineralogy. Stamp 2 shows the electron density corresponding to 1,3-ß-glucanase from potato. This enzyme is in the plant's armoury, breaking down carbohydrates from the cell wall of pathogenic fungi. The structure was determined at 1.26 Å resolution in the Centre for Biocrystallographic Research (Poznań, Poland) by Agnieszka Wojtkowiak and Mariusz Jaskólski. Stamp 3 presents the final product of crystallographic research, in this case the 3D structure of a protein molecule. This molecule, N-methyltransferase NodS, shown in complex with SAH, is involved in establishing nitrogen-fixing symbiosis between legume plants and soil bacteria. The structure was determined at 1.85 Å resolution also in the Centre for Biocrystallographic Research (Poznań, Poland) by Ozgur Cakici and Mariusz Jaskólski. 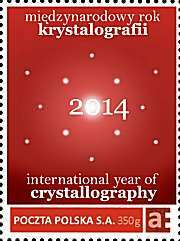 Stamp 4 shows the official logo of the International Year of Crystallography celebrated in 2014 under the auspices of the IUCr and UNESCO.